On a freezing cold November day, one obviously grabs the warmest sweater in her closet :) Yesterday was a COLD one. We got a sprinkling of snow, but nothing like the “Wall” that hit Buffalo. I lived on Lake Erie for two years, and it can be a beast in winter! While taking these photos (in under 2 minutes), you can see my lips got a little purple, and a hot mug of coffee was downed when I returned inside! I can definitely see myself wearing this outfit again and again. 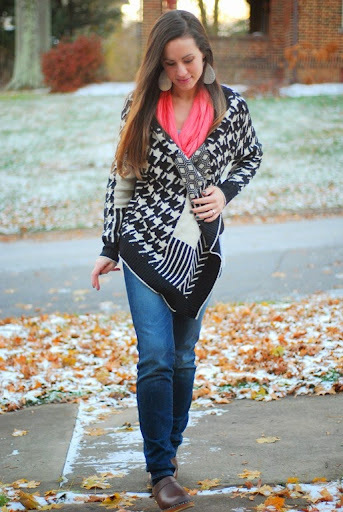 The black and white sweater is really complemented by the burst of peachy pink in the scarf. My boys are needier than ever these days, so I have about five minutes a day to brush my hair and swipe on some makeup. These are the golden years though. :) I may be pretty worn, but I have more joy in my life than ever. Loving that sweater with the scarf- so cute! Love that sweater! You are so right- the time we spend building and cultivating our family are really the golden days. Such a great sweater! Love your earrings! 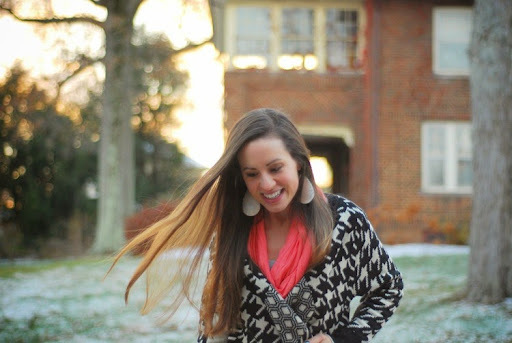 The black and white sweater with that bright colored scarf is really cute! I love it! This is so cute! love the pop of color in the scarf! 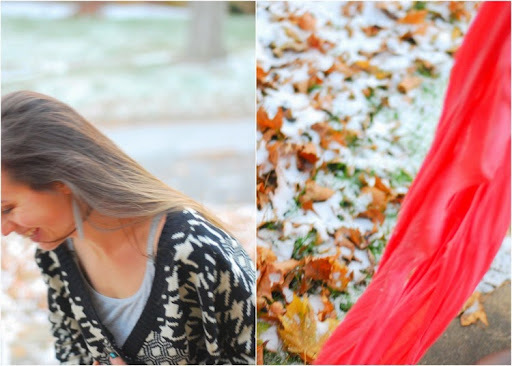 I'm instantly drawn to your colourful coral scarf and I love the waterfall type cardi's. Fab pattern. You look great. Great cardigan and great use of the colorful scarf. Kids demand so much of our time but so worth every second. P.S. Hope you will stop by Thursday for TBT Fashion link up.